Still playing catch up here on bonuses that came out last week during our vacation. This offer has been around for a few days so we are not sure how many more people can take advantage of it as it is limited to the first 15,000 registrants but it is for 1,000 free Gold Points when you follow Club Carlson on Twitter and connect your Club Carlson account via the registration page. These points are part of a larger promotion called #hashtaghotel which will take place on May 31st. The #hashtaghotel promotion is a 24 hour private event on Twitter (all you need to do is follow them to get in on the 'private party') where they will be giving away elite statuses, bonus points and more to some of their lucky followers. Can't make use of this promotion? 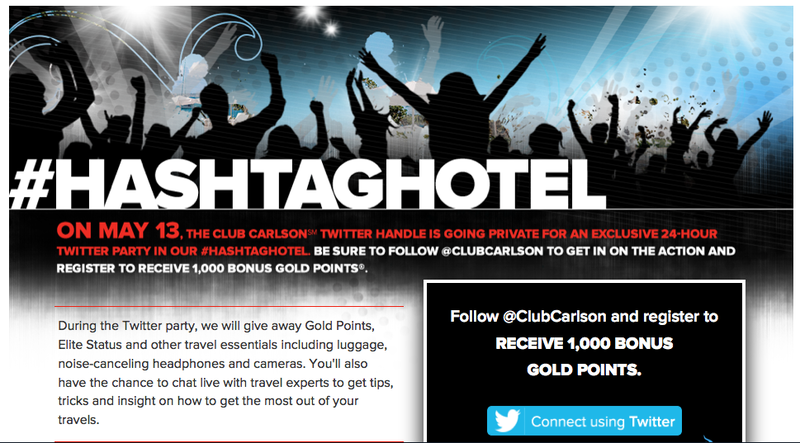 Be sure to visit our Club Carlson Bonus Gold Points page for dozens of other bonuses!